An striking two tiered wedding cake stacked with a beautiful sugar castle perched on a candlestick above the cake. Decorated with elegant orange sugar Cala lilies and large dark green leaves. 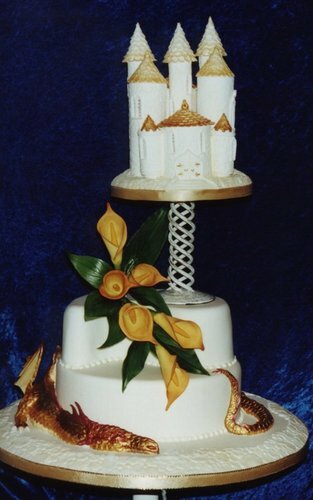 A golden dragon wraps itself around the bottom tier for the ultimate fairytale cake.